Outfit inspo. I should probably take more pictures of these kind of outfit inspos that I see almost everywhere on instagram and blogs. They're so much fun to do! 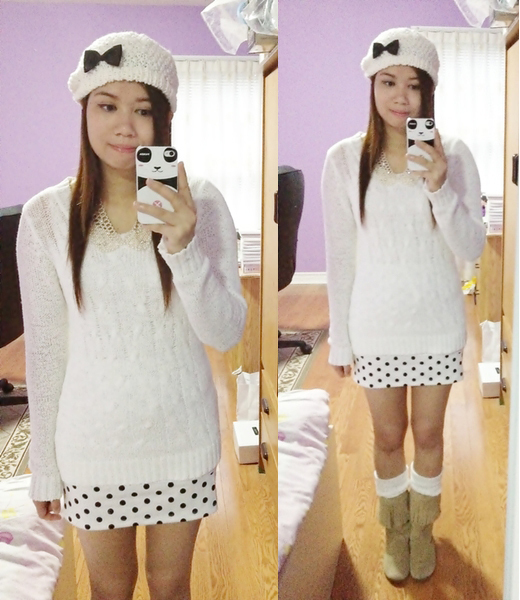 My knit sweater is from Suzy Shier, collar necklace from H&M, white black polkadots skirt from Forever21, beige fringe boots from Spring and my knit hat with a bow is from le chateau. An individual close up picture of my pearl with diamonds collar necklace since you can't really see it that well in the other pictures. Love love love this necklace sooooo much! I always get so many compliments at work whenever I wear this necklace.